(As usual, please forgive the weird spacing issues on this site - The Blogger Editor is up to its old tricks again! I've tried to fix the spacing issues by placing dots and bullet points to make the site readable. The ECRI released its weekly data from 7/16/2010 yesterday and it is now showing a drop or growth decline of -10.5%. Declines of this magnitude are absolutely indicative of a recession. Now as I've mentioned, officially the NBER has not called the recession over, (I guess they have mental images of President Bush on the aircraft carrier), however by any stretch of the imagination economists should have declared the recession over with the managed recovery we've had. Of course little things like employment and housing that have not recovered shouldn't stop a few economists and administration officials from stating the obvious right? IF they did declare the recession over, this data would tell us that we were going to double dip with all doubt removed. However, now that our friends have held off from declaring victory we may have the fabled L shaped non-recovery. Other indicators of slowing are showing up. I will not post the data here, but rail tonnage is slowing and with carriers are even seeing declines versus last year. Can you say WHAT? I thought last year things were terrible and everything this year was all better? I thought the US consumer was back and commodities were on a tear? Me too. Last week almost all categories of shipments were down when compared to 2009's easy levels and this week a few of the categories remain slow again (coal, autos, and food), that is slower than 2009 levels and much lower than 2008 levels. KSU's shipping declined significantly and so did KSU in Mexico. EUROPEAN STRESS TESTS - STRESSED NO MORE? European Stress Tests were released today and the US markets caught another surge higher. The uncertainty is gone for now, but the weekend will give traders and portfolio managers time to examine the sparse details and released information provided in the sham tests. Are we going to feel better about the solvency of the banks when they really didn't stress them and didn't analyze the cost of default of sovereign debt on their balance sheet? The potential of country debt defaults is exactly what exposes these banks to their very death! If Greece, Portugal, Spain, or Italy don't have debt problems then these banks don't have problems (don't even mention mortgage assets - that is so 2009, even though it hasn't been addressed, but don't let reality stop a rant!) Isn't it ridiculous to think that the regulators ran this test and show the results like they've accomplished something? Isn't it funny to think that 7 banks in Europe failed anyway? Isn't it funnier to think our markets rallied on this news? I'll leave you with the optimistic quote of the day from someone on CNBC right after the release. "It's not that the banks are failing, it is that the banks have failed a level of stress, and they are taking steps to improve it". Yes, I guess that is one way to look at it. To test how this view works with other applications, let's run it through the British Petroleum version of the stress test. Say this with me ------"It is not that BP is failing to be a good company and manage the environment effectively, it just failed a level of stress, and they are taking steps to improve it". Feel better about the Gulf of Mexico don't you? I thought you might! Perhaps I'll begin to look at all failures with this view! It's not that they have failed, it is simply that there is a failure to communicate! Well, we are more than half way through the year. The market, if you can believe it, is just about even with where we started, and there is only one word to describe the action, volatile. If you are trading daily and you are lucky, you are probably breaking even. If you are not lucky, you are being ground up in the daily, unreasoned swings that occur because the high frequency trading computers run the show. Call them Skynet (Terminator reference) or Hal 9000, they are doing a job on most active traders. Unfortunately those that are buy and holders aren't doing any better. Is it any wonder that treasuries and corporate bonds are the best performers this year? I have been busy on several projects and that has kept me from writing, but I have had this topic on my mind to review where I thought things were going. I really love looking at this because it provides great information as to how right and wrong one can be at the same time. It also allows me to tweak my longer term thesis and review if there has been a significant change that has an impact on my outlook. Let's jump into it shall we? I SAID - 1/3/2010 - Interest Rates will rise, but not at the direction of the Fed. - The market will demand a more just compensation for the risk it has taken in Treasuries. The 30-year will hit 6%. The market is predicting a rise in the Fed Funds rate coming in August, but I think they will delay raising rates overtly until November or December at the earliest. Any slow down in the economy will be another excuse not to raise them at all in 2010. REALITY - 7/20/2010 - Ok, interest rates on the 30 year are more like 3.95% so we don't look like we are in danger of hitting my more reasonable 6% target. So why are we not at a reasonable 6%. I think for two reasons. A) There is still tremendous fear in the market and investors would rather buy certainty (that they get paid back their money) rather than risk it in the markets. B) I think that there is actually a level of true Quantitative Easing being done despite the fact that it officially has stopped. What I saying is that there have been a number of buyers of treasuries that have been buying in size that don't really typically opt for these instruments. So while other buyers of our debt have reduced their consumption, the United Kingdom somehow has stepped up mightily and has purchase somewhere near $200 Billion in treasuries over the last several months. These guys are massively mired in debt and running deficits. Where'd they get the cash to buy our T-Bills? Doesn't matter, I've missed it so far, and frankly, I've changed my tune on this one, we won't see those 6% rates till there is a shock where investors absolutely shun the USD and Uncle Ben will do anything to stop the move up in rates, cause he has to. I expect that we will see a 30 year mortgage at 3.5% by mid 2011, so give me a -1 to start out the 2010 Predictions Mid Year Update. I SAID - 1/3/2010 - While the Fed stated they will stop Quantitative Easing in March of 2010, they will not be able to stop because losses on their book will be immense. REALITY - 7/20/2010 - We as you look above, the question really is, did they really stop? I would bet they haven't, and we'll actually see more public admission that they are going to publicly do it. Uncle Ben this week in his testimony on the Hill stated that they are committed to extraordinary steps to keep the fragile economy afloat (my words not his, but that was the meaning). I SAID - 1/3/2010 - Housing issues will improve through April at which time the impact of increasing interest rates will force the hands of banks and they will begin to release their inventory of "non-foreclosed homes" on the market pushing the new wave of speculators underwater teaching them that falling knives are tough to catch. Some are pointing to the HAMP requirements that state that banks that had home owners that modified mortgages and failed to keep the terms of the deal (make their payments) must release this inventory and use short sales as the tool to divest themselves of the inventory as another reason for a coming drop in home prices. I don't see it that way, I see the government changing their minds again and lifting this requirement when they figure out that it could hurt the recovery. REALITY - 7/20/2010 - I think this pretty much was nailed. Check out today's report by NAR about the surge in predicted annualized sales through April and guess what, it is going in the tank. Ummm, look at that inventory build there too. Isn't government stimulus effective? I SAID - 1/3/2010 - We will see at least 2 currency devaluations in 2010. These will manifest themselves in the form a North Korea style announcement where you will wake up and the currency will be declared -10% less in value or more. These devaluations are necessary to continue each country's desire to sell goods cheaply abroad. The US' motivation of course is simply to reduce the relative amount of the crushing debt that we continue to heap upon ourselves. 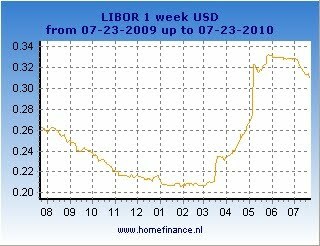 REALITY - 7/20/2010 - We haven't seen this yet, but effectively, the rise in the USD has helped prevent this situation. If we see Geithner and Uncle Ben resume the significant devaluation in the dollar as a measure to inflate and get us out of this mess, we will see these in the back half of the year. I'm conceding this as a miss. Note that Argentina is essentially defaulting on debt to bondholders by forcing an exchange, it isn't a currency adjustment, but sure is sucky if you're told to take new bonds (less bonds). I SAID - 1/3/2010 - The Euro will face continued pressure, the US dollar will rise significantly against the Euro from the 1.432 level it is as of this writing. REALITY - 7/20/2010 - Problems in the Eurozone will not go away even if they can pull off a US style sham with the bank stress tests. They still have major issues of spending too much and promising too many benefits in the nanny state. Need a preview of where our government is taking us? Look no further than the week Euro, out of control spending, and a detachment from math that is temporary. Ultimately Europe and the Euro fail. I SAID - 1/3/2010 - The dollar will strengthen against the yen. REALITY - 7/20/2010 - Hasn't happened. The Fed and Treasury have had been luck keeping rates low and Japan has not been as effectively using QE as I thought relative to the US. Remember, this is a race to zero and Japan has been in deflation for 20 years. I will patiently wait for this, but they are clearly worse than the US. I SAID - 1/3/2010 - Fannie Mae and Freddie Mac will become the dumping ground for all private mortgages loans made in 2009 and 2010. The banks will avoid taking losses and pass all of them to the US taxpayer. The Christmas present (uh-unlimited losses) that the government gave the US tax-payer on Christmas day is unbelievable. For the next 3 years the loss limits on these two organizations have been lifted and we are backing them with a blank check. REALITY - 7/20/2010 - Ok, I'm not sure if this was really a stretch in predicting anything. These companies are toast, and we the US taxpayer are unwillingly footing the bill for complete insanity. I SAID - 1/3/2010 - Small business lending and personal credit will continue to decline through 2010. REALITY - 7/20/2010 -Lending is still extremely tight. The administration and Congress just past legislation in an attempt to get small business lending going. While I applaud this, this probably means an abandonment of conservative lending principles and we'll see losses in this area of government generosity as well. I SAID - 1/3/2010 - Gold will actually decline to the $950 area and then move higher later on in the year when it becomes increasingly obvious that Bernanke and Geithner have no intention of pulling liquidity. This will be the opportunity to add more to the position. Gold ends the year in the $1150 to $1200 range. Longer term, gold is still a buy. REALITY - 7/20/2010 - Gold is still at $1192 as of this update (7/23). The gold market has not dropped as much as I anticipated, but certainly hasn't ramped up higher. I am still looking for the move down to the $950 to $1,000 area though after an anticipated ramp up again. You could potentially buy it and then sell it higher, but you face serious risks in timing it. I SAID - 1/3/2010 - US equity markets will end the year slightly positive (meaning less than 5%). This year will be volatile and gains should be harvested when they are acquired. This means that there will be periods of gains and you need to take advantage of the ranges in the markets and buy at the low end and sell at the high end. I still maintain that the Fed will support this market directly or indirectly at all costs. As housing reverses, be prepared to see unexplainable increases in equity markets. Bernanke knows the conventional thoughts that the collapse in 1937 occurred because the Fed increased rates too soon, he'll be sure not to repeat that lesson. This is how we'll be sure to over inflate and also create the next collapse in 2011 or 2012. REALITY - 7/20/2010 - Pretty right on so far, but I would actually look for a move up in markets over the next month or two and then a slide down in the months of October and November. There will be no rate increases by the Fed. I SAID - 1/3/2010 - Middle East tensions will boil over. The US will give Israel the green light to defend herself and presumptively attack Iran. Russia and China will condemn the attack and they will choose the side of their trading partner against Israel by selling arms and providing material support. Upon attacking Iran, Syria and Lebanon will engage Israel on their northern fronts. REALITY - 7/20/2010 - Tensions are mounting. The longer we languish economically I believe we will see an increase in tensions in the Middle East. I SAID - 1/3/2010 - Oil moves to $100 this is based on the continued debasement of our currency through the actions of the Fed and Treasury and also geopolitical tensions. REALITY - 7/20/2010 - Oil is now back up to $79. A move to devalue the dollar any will result in meeting my $100 projection. I SAID - 1/3/2010 - Republicans sweep away the majority held by the Democrats in the mid-term elections. The third-party movement continues to garner support but is quashed by the two party system. REALITY - 7/20/2010 - This looks as though it is moving in the direction I thought, however, I am looking at the impact of the Tea Party Movement which is being marginalized by it's inability to speak through the labels that both the Republicans and Democrats are throwing on them. Unfortunately the Republicans have swept in and made efforts to identify with the Tea Party (and I'm sure some do), but the cost of allowing Republican incumbents to take the Tea Party mantle is that there is no real and lasting change and you continue to have the same political elites in power. In a sense for me the Tea Party movement is about new leadership and fiscal responsibility, not the same old structure and system with new faces. I SAID - 1/3/2010 - Obama names a replacement for Justice Ginsberg who retires in 2010. REALITY - 7/20/2010 - Ok, that was an easy one. I SAID - 1/3/2010 - Obama is able to pass some sort of health reform. He passes the reform knowing that it is unconstitutional. The strategy is to destroy the health care industry as we know it in the next several years. When the high court determines that the legislation cannot stand, a one-payer system (government) medical system will be the only option left to pick up the pieces. The final step will not take place till 2013 or 2014. No matter what, abortion will be a major component of the bill and will not be removed. REALITY - 7/20/2010 - Yes, this reform was passed. We do need change, but this is a mess and more importantly, it is a financial mess. I've written at length that the cost is out of sight and I am not being over the top. This is a disaster. Abortion is a component of this bill and despite the "Executive Order" lie that was provided by our president, we are paying for these with tax payer dollars. I have rethought my notion that the Supreme Court will strike down the legislation. It will not, this system is here for good. The losers are the US consumer and tax payer, the winners are big government advocates and big pharma. I SAID - 1/3/2010 - Despite failed terror attempts our personal rights and privacy will continue to be eroded in the name of our safety. Our government will continue to take measures to protect you after each attempt (meaning safety measures that will waste your time and add little to your safety). REALITY - 7/20/2010 - Little erosions continue. We have now discovered in the health care bill that all purchases made by businesses over $600 must be recorded and issued a 1099. This is far reaching and an encroachment of personal privacy. The impact is also being felt by gold and silver dealers that now must record and issue a 1099 on all purchases of gold or silver in excess of $600. What is the purpose of this? Tax revenue generation, but also a deeper view and insight into the personal transactions of the person in the US. OK, thats a wrap. For those of you keeping score at home, the mid-year update has a score of +6 total. The tally looks more like this. +9 Correct right now. -3 are incorrect now. 4 with no rating. So 9 out of 17 so far. This isn't about being right or wrong, it really is about making a statement of what I think will happen and why. Over the last several months we've seen markets trade within a 200 point S&P500 range (20%). As of completing this post today, we are waiting on the European stress tests to come out and convince us that all European banks are healthy and the markets should feel really good about the global economy and recovery. I personally believe that we will rally for the next month or so and then more reality will set in. I've written a lot about the possibility of a double dip recession and what is interesting is that we've had no formal announcement from NBER that the recession is even over. I guess this is a way to hedge your bets and state that there is no double dip - you just never get out of the quicksand in the first place. I've been laying the ground work for a strategy on the next drop in markets that I will employ and I'll share just a few thoughts about it. US growth is estimated to be a 2% to 3%. Emerging market growth is obviously predicted to be much higher somewhere in the 8% to 12% range. These countries would includes Vietnam, Malaysia, China, India, Brazil, and more. As we look at this, you must ask yourself where you think the best stock market performance is going to be. Obviously, you would expect many of these countries to outperform. How do you put it together? First, the easy one, you simply buy those countries. Second, if you want to give yourself some protection, you could take steps out short US and go long these countries in a relative value trade, hoping that the countries go better. This gives you some downside protection if they all go down, but you will still suffer. Ultimately, I think very long term, this will be a home run strategy as millions and millions of new world citizens rise to the ranks of the middle class. This also makes sense on so many levels as it removes our dependency on our government to actually make responsible decisions and somehow navigate us out of the mess we are in. If, as the Fed and Treasury desire, they are able to devalue the USD, you'll also win on the currency bet side of things as well. If deflation in the US takes hold, this strategy my hurt you on the currency side of things as the USD rises in value, but you will hopefully also receive rewards from getting out of the US equity markets into ones that actually will grow. Ok, enough rambling on this post that has taken a few days to write. I will develop the relative value trade more and put out some charts to examine. I'll also do something on gold. I've thought for a long time that our government would do everything in its power to stop the gold increase and I believe the healthcare bill is just one step to crush the move higher in gold long term.